The Vintage Round Top is a haven for inspired living that marries style, sustainability and soul. For our most recent addition, The Boho, we collaborated with several makers, collectors and artisans to create timeless items that were used in construction and as decor. Each collaboration was a work of love, and through meticulous design and craftsmanship we were able to achieve one-of-a-kind pieces and designs with our dear friends. We found Forrest Middleton's gorgeous handmade tiles through Clé Tile and love the cool vibe they add to the additional bathroom in the Boho Cottage. Cara's naturally hand-dyed fabrics make for beautiful and original pieces. We partnered with Cara to make the fabric for the headboards in the Boho cottage's Guest Bedroom. See more of Cara's work here. Microcemento is a trademark material of Topcret and is a seamless, thin coating that creates a unique and versatile look. We were able to contact one of the two suppliers of the material in the United States, who was conveniently located in Houston! The antique blues and grays in the tile from Porcelanosa make the Guest Bathroom shower and soaking tub just as stylish as the Master Bathroom. We collaborated with Carol Hicks Bolton Antiquities for the custom bedding and textiles made from vintage and found fabrics. We constantly get compliments on how well our beds sleep, and it's no surprise why! Each mattress from Stearns & Foster is meticulously crafted and handmade to provide the highest quality sleep. Made from 100% American-Made wool strands, this custom tapestry is hand-dyed by artist Lauren Williams in Dallas, Texas. We worked with Mosaic House, out of NYC, to source Zellige tiles, a Moroccan glazed clay tile, to be used in our kitchen and guest bedroom bathroom! Our sweet friend Becki Griffin of Curious Details is a mastermind at the finishing touches. She helped me add in the details that make a difference, like in our great room hutch that is filled with unique finds! One of our favorite sources for reclaimed materials, Recycling The Past, provided these wooden beams to serve as the focal point for our Boho Great Room. Our good friend Jon created beautiful custom cabinetry in the kitchen, along with a custom vanity in the Guest Bathroom. He even retro-fitted these awesome drawers for the vanity in the Additional Bathroom. See more of his work here. We worked with Houston Custom Metalworks to bring our design for a stove hood to life using vintage scrap pieces of metal. They also created these beautiful brass countertops that we consistently get rave reviews on! 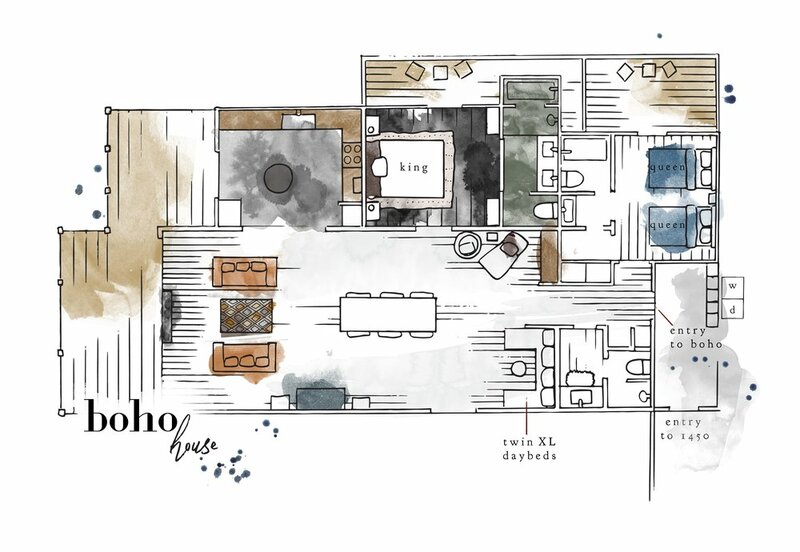 We worked with MaRS, an architect design studio based out of Houston, Texas to develop the layout of our Boho cottage. They helped us take an empty garage and transform it into a space that all could enjoy. Our friend Doug Forrest created the wooden dress hanging outside of the Guest Room in Boho. The piece complements the flooring and adds a feminine, handmade touch to its glam surroundings. We worked with Select Blinds to choose the window coverings for our kitchen, great room and guest rooms. For us, the details matter - even down to the window treatments! Our beautifully illustrated cottage layouts were created by Houston-based graphic design studio Nib and Pixel.